Thomas has elected to retire as an NFL player in order to pursue a doctorate in psychology, NFL.com reports. Analysis: The 30-year-old can thus be crossed off the list of potential late summer free-agent additions at the tight end position. Thomas is coming off a 2017 season in which he logged 41 catches for 388 yards and three TDs in 14 games for the Dolphins. The 2011 fourth-rounder's playing career peaked in 2013-14, when he logged back-to-back 12-TD campaigns while with the Peyton Manning helmed Broncos. Thomas (foot) is a free agent, Ian Rapoport of NFL Network reports. The Dolphins are expected to release Thomas (foot) on Wednesday, Armando Salguero of the Miami Herald reports. 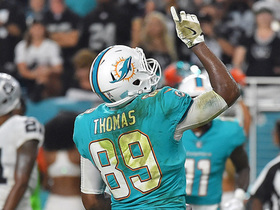 Thomas (foot) is expected to be cut by Miami in a move to clear up salary cap space, Barry Jackson of the Miami Herald reports. Analysis: Thomas only had 41 receptions for 388 yards and three scores before being placed on injured reserve due to the foot injury. If the Dolphins were to part ways with Thomas they would save $6.6 million against the salary cap. The Dolphins would be forced to acquire a TE if they were to make this move either via the draft or free agency. 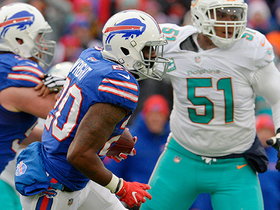 The Dolphins placed Thomas on injured reserve Wednesday with a foot injury. Thomas snagged two of four targets for 11 yards during Monday's 27-20 win over the Patriots. He fumbled during the contest. 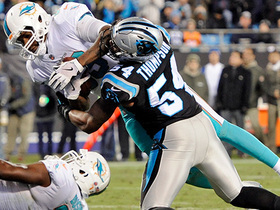 Analysis: Thomas entered Monday with at least 50 yards or a touchdown in four of five games. He narrowly missed keeping that streak going when he and Jay Cutler failed to connect on a deep ball down the left sideline in the third quarter. The veteran tight end is clearly improving from earlier in the season, but at the same time, he had just one more offensive snap, 43 to 42, than fellow tight end Anthony Fasano. Thomas brought in all three of his targets for 20 yards and a touchdown in Sunday's 35-9 win over the Broncos. Analysis: The veteran tight end touched up his old squad for a score when he brought in a nine-yard touchdown pass from Jay Cutler in the second quarter. Thomas has found the end zone on three occasions over the last five contests and seemingly carved out a modest but consistent role as a secondary option in the passing game. Thomas brought in five of six targets for 52 yards in Sunday's 35-17 loss to the Patriots. Analysis: The veteran tight end continues to emerge in the latter half of the season, with Sunday's performance marking his third game over the last four in which he's logged at least four catches. Thomas also has his only two touchdowns on the season over that span, as well as exactly half of his 34 receptions. The 29-year-old has proven he can still get downfield when given the opportunity and is likely to have an extra bit of motivation against some of his old Broncos teammates in a Week 13 matchup. Head coach Adam Gase relayed that he expects to get Thomas more involved in the offense as the season continues, Roy Cummings of Florida Football Insiders reports. "Yeah, with Julius, I didn't get him going enough early in the season," Gase said this week. "But I feel like we've gotten [back] into a little bit more of a groove with him now, and I still think there are some other things we can do." 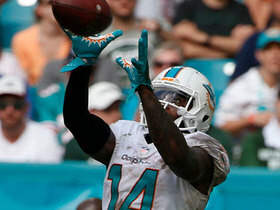 Thomas had four receptions for 30 yards as the Dolphins lost to the Buccaneers, 30-20, on Sunday. Analysis: Thomas was only targeted four times during the contest but reeled each one in. He hasn't been the red-zone threat that some were hoping for after being reunited with Adam Gase, which seems unlikely to change in the near future. Now that bye weeks have completed, Thomas is a candidate to fall out of favor in the majority of formats. 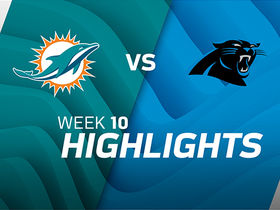 Thomas caught two of five passes for eight yards and a touchdown during Monday's 45-21 loss to Carolina. 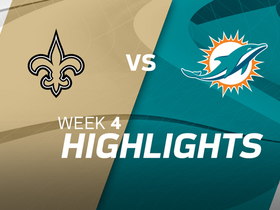 Analysis: Thomas got Miami on the board late in the first half with a two-yard shovel pass for a score. It was Thomas' second touchdown in as many games after opening the season on a seven-game scoreless run. He's also been a bigger factor in the offense with 13 targets in two weeks after averaging just four per game to start the season. 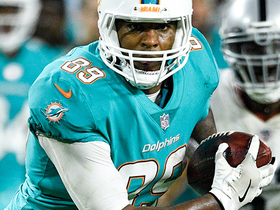 The Jay Cutler-Thomas connection seems to be picking up steam, but is Miami's offense a unit you really want to hang your hat on at this point? Thomas caught six of eight targets for 84 yards and a touchdown during Sunday's 27-24 victory over the Raiders. Buffalo Bills cornerback Shareece Wright comes away with an interception and picks up 48 yards. 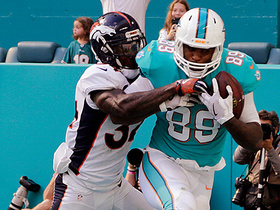 Miami Dolphins tight end Julius Thomas shakes defender for 9-yard touchdown catch vs. the Denver Broncos. 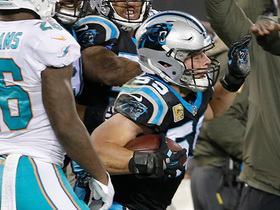 Carolina Panthers linebacker Luke Kuechly picks off Miami Dolphins quarterback Jay Cutler. 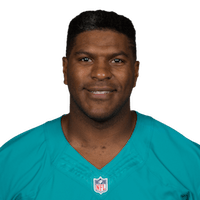 Miami Dolphins tight end Julius Thomas caps off drive with a 2-yard touchdown. Miami Dolphins quarterback Jay Cutler shows some great touch as he hits tight end Julius Thomas for 27 yards. Miami Dolphins quarterback Jay Cutler fires across the middle to tight end Julius Thomas for a 15-yard touchdown. Check out some of the best plays from Miami Dolphins receivers so far in the 2017 season. 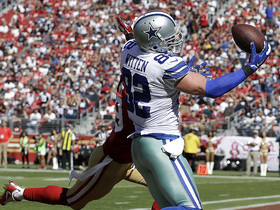 Check out the best one-handed catches from Week 7.